If you don't know your science fiction, then I'm afraid you're beyond my help. Every day is Christmas when Keng sends me tea. Our mind-bendingly generous Singaporean teachum has this time provided a tuocha from a factory that I have not encountered before - perhaps because they are based on a distant planet, as befits their Cylon nature. In an attempt to determine the age of this extra-terrestrial specimen, judicious scouring of Taobao leads me to conclude that it probably comes from somewhere in the 2000-2006 interval. Feast your thirsty eyes on that dome of rusticated tips, pictured below. This little fellow has been well-aged, although it has little aroma. 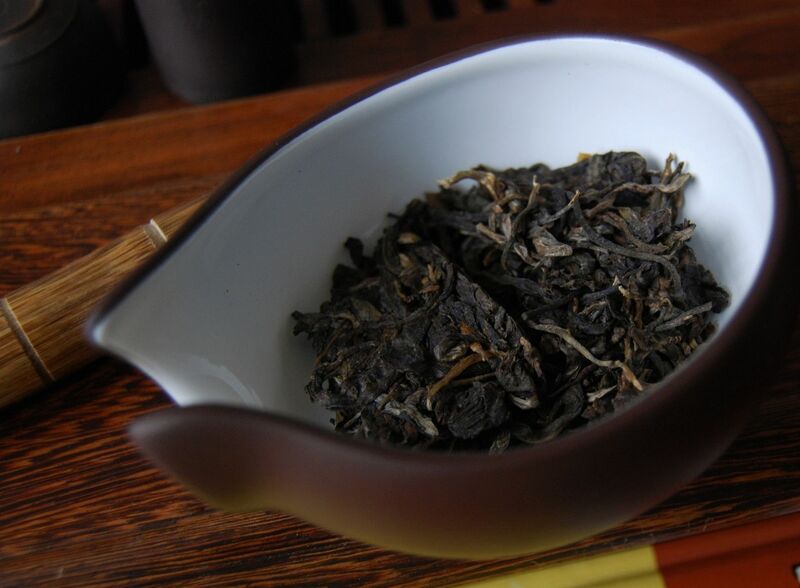 "Teji" [ter-gee] refers to an apparently high grade of leaf, but really those grades are useful only for comparing products from within the same factory, requiring knowledge of how that factory ranks the grades. As it is, I know little about our Cylon friends, and so conclude little from the name. 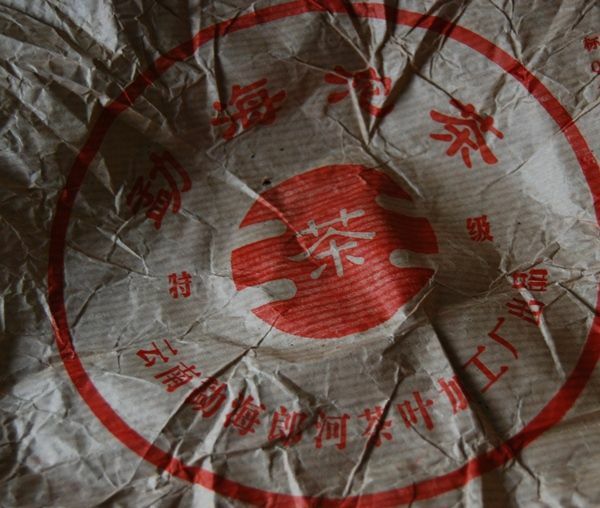 I am quite amused by the wrapper, however, which reads "MENGHAI TUOCHA" across the top in Chinese characters, with the factory's actual name (Menghai Langhe) appearing in smaller letters at the bottom. It takes me a while to twig that this is actually shupu. When the water hits the leaves, the unmistakeable aroma reminds me that I am being a twit. The shengpu versions have a green Cylon wrapper, while the red corresponds to shupu. 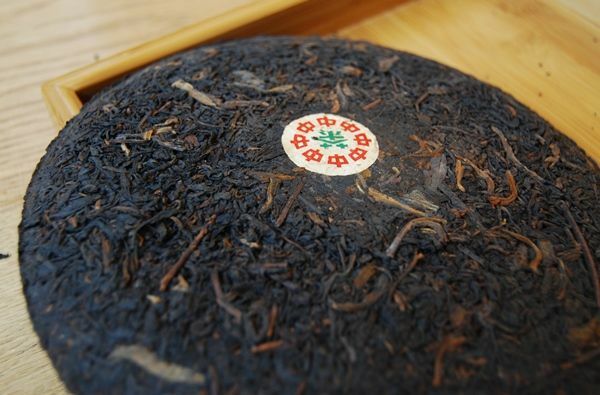 Even the grade "teji" is most often applied to varieties of shupu. It is powdery, in the manner of most shupu, but very pleasant and clean. 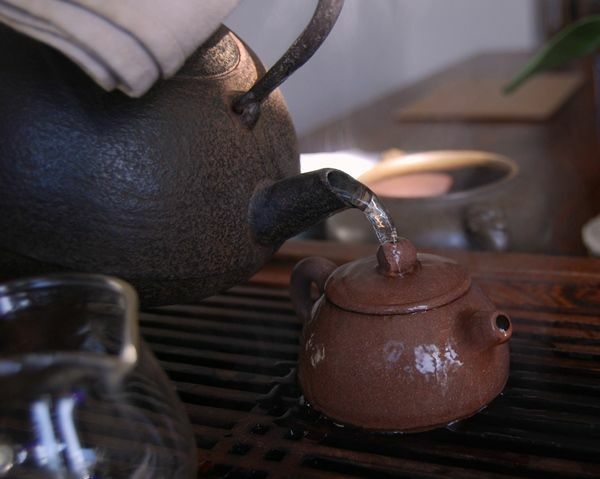 I brew it hard, as I tend to do with most shupu, to wring every last drop of power out of it, and the results are satisfying on a cold day. 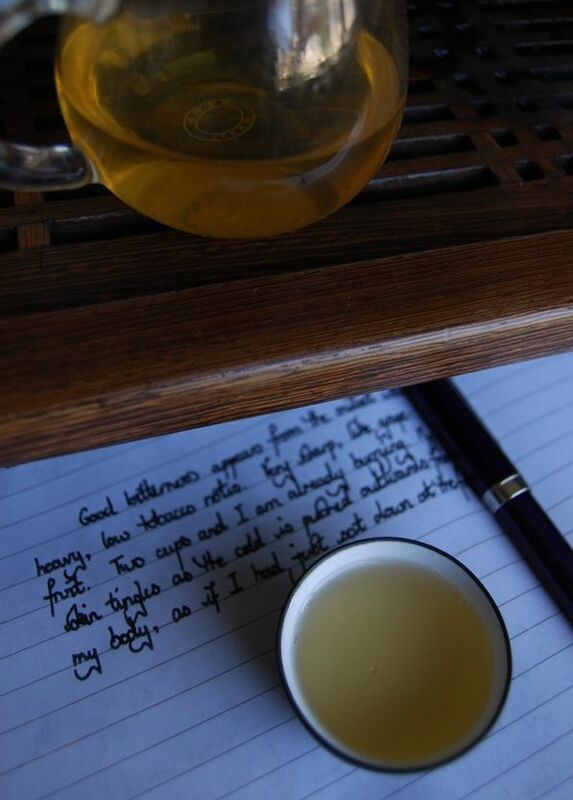 Thanks again to Keng for yet another good tea session. I'm stranded in lovely Lyon for this week, and so present some notes from a recent session back at home. If any readers are down here in the south of France, do let me know! 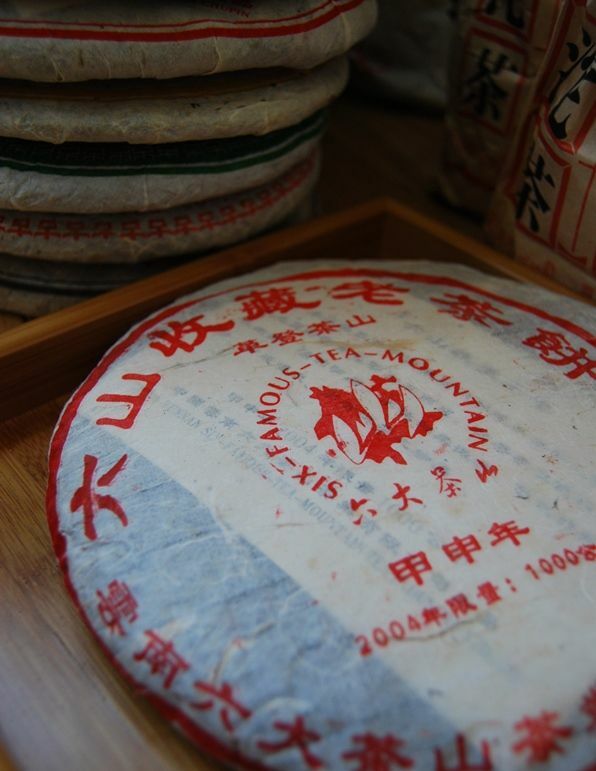 The Liudachashan (Six Big Tea Mountains) Tea Co. used to make some delicious tea. 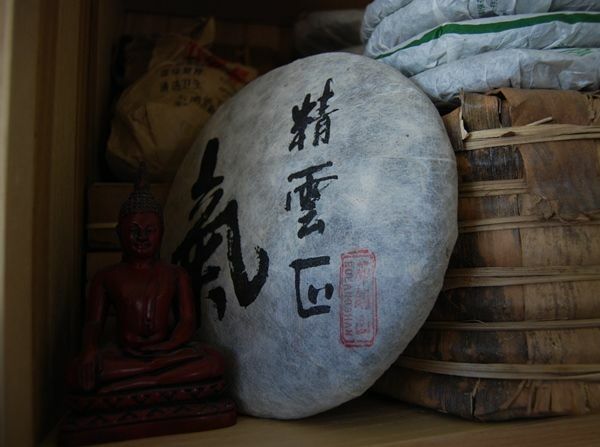 I have a half-tong of the 2002 Zhangxiang [camphor scent] and of the 2003 Jingmai Pangxiejiao [crab foot], with random cakes of the 2003 Lincang and 2003 Youle. These range from the simple and delicious to the complex and delicious. 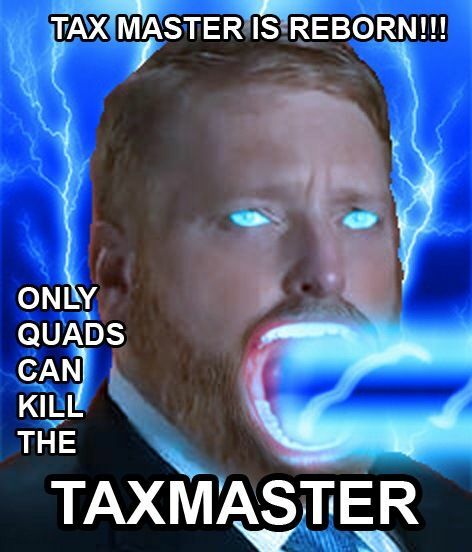 Many thanks to Keng for introducing me to these very solid 6FTM examples. Gedengshan is in Mengla County of Xishuangbanna - the county that also contains Yibangshan, Youleshan, Manzhuanshan, and Mangzhishan. Something odd has happened to me of late. The geography of Yunnan has "clicked" into my mind, and suddenly the places and names seem less abstract, and associated with particular locations, the relationships between which I can chart with the various cakes that I have encountered. Suddenly it all makes a great deal of sense, and I find myself having to check my maps marginally less regularly than before. If we think of the main tea prefecture, Xishuangbanna, as being, say, Texas (relative to the rest of the US, which is Yunnan in this simile), then Mengla County is in the south-east corner. It sticks out into Laos. 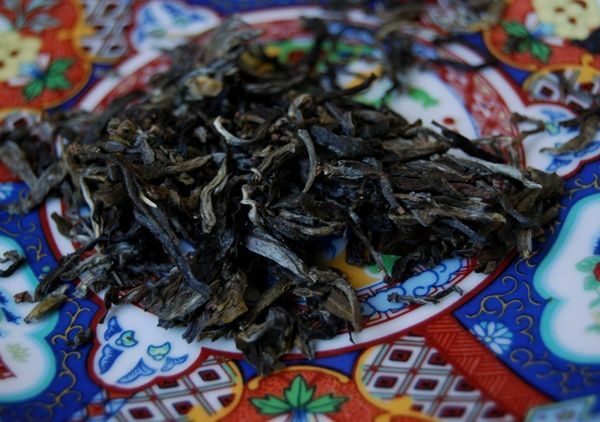 In the local dialect of Banna's ethnic group, the Dai, Mengla simply means "tea district". 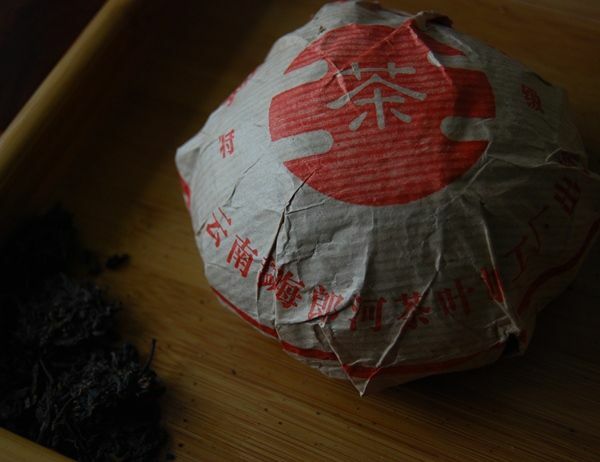 The wrapper reads "Liushan Shoucang Laochabing", or six-mountains collector old-tea cake, in large characters (shown in the uppermost image). Just looking at the cake makes me thirsty. As with the other 6FTM productions from this era, it is rough, dirty, loosely compressed, and entirely appealing as a result. The shaggy edges and large leaves do it proud. The large, flat leaves have darkened well, as you may see in the photographs above and below, and there is a distinctly humid aroma about them, courtesy, I assume, of the default storage in Singapore. 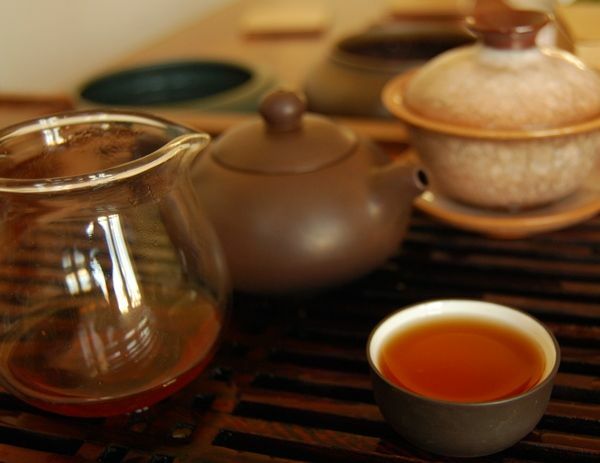 The hot, humid environment seems to act most favourably to the tea's benefit, in its idiosyncratic manner. The soup is a heavy red-orange, as shown below. It has a thin yellow miniscus about it already, further testament to Singaporean goodness. 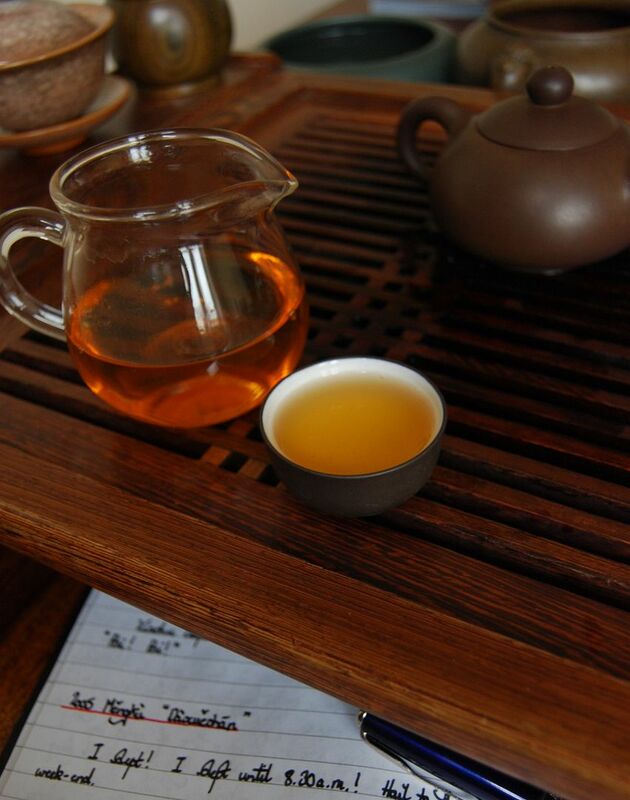 As I hoped, it is a vivid and sharp tea, with plenty of excellent woodiness about it. 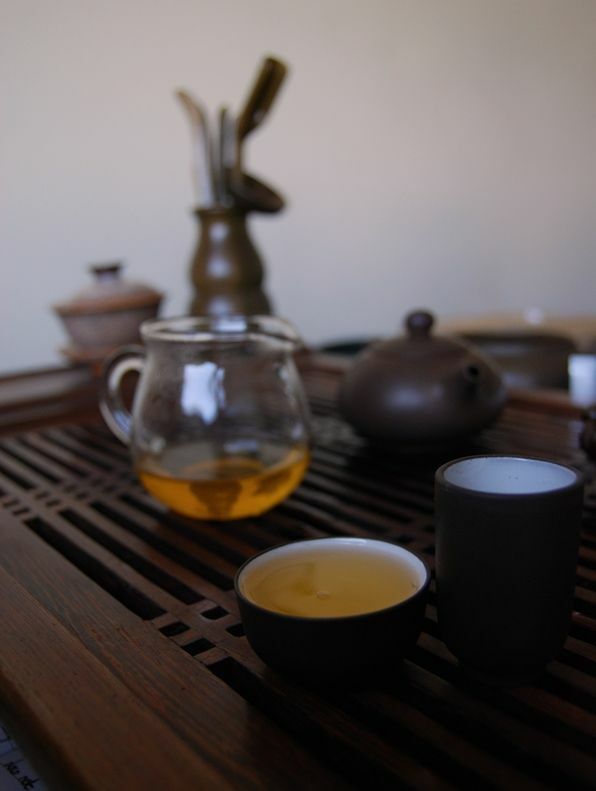 The kuwei resides in the throat like a grumpy old man propping up the bar, refusing to budge at the end of the night. Its woodiness is of a pine-like variety. Entirely delicious. Sweet and smooth, it continues well. By the time the eleventh infusion comes around, we are brewing for substantial periods, in order to wring every last bit of oomph out of the leaves. Turning them out of the pot afterwards reveals their large, fragmented appearance, and well-aged colouration. In parallel, I drink the remainder of the 1980s qingbing, so generously provided by Keng. 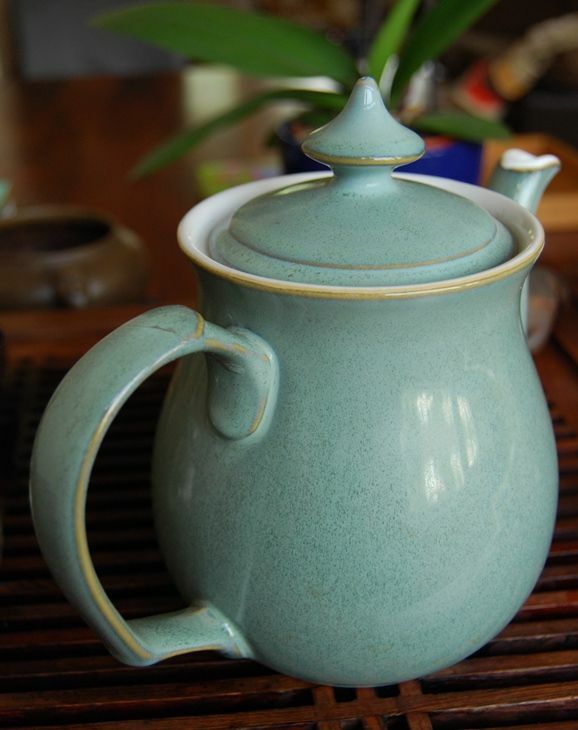 It has provided many dozen infusions, brewing long and slowly in Gertrude, my celadon / qingzi gaiwan (shown below). My suggestion is to keep your eyes peeled for older 6FTM cakes (perhaps before 2005). They look rustic and simplistic, they're often priced very reasonably, and yet they can provide enjoyment far beyond the modest asking price might otherwise suggest. If you favour a little humidity in your storage, then you may factor that into your decision, too. A quick trip to Taobao might yield successful results, were you of the mind to try it. Thanks again to Keng - fun stuff, and a lovely session. Regular readers may have gathered that my Singaporean teachum, Keng, has provided me with tons of tea over the past few years. Absolutely tons. His generosity really is genuinely staggering. 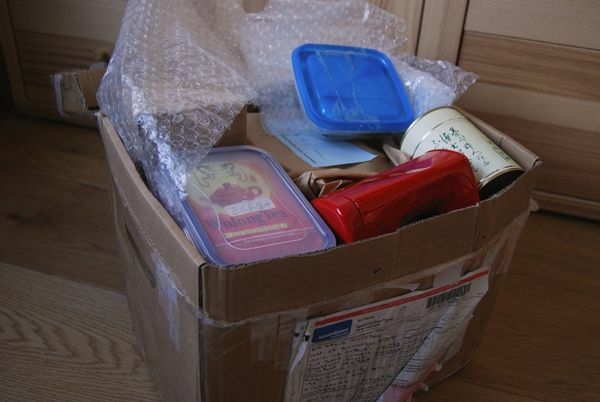 His Kengship recently sent another enormous box, which seemed to make the Singapore-to-England trip in just a few days. It's like an early-spring version of Christmas. 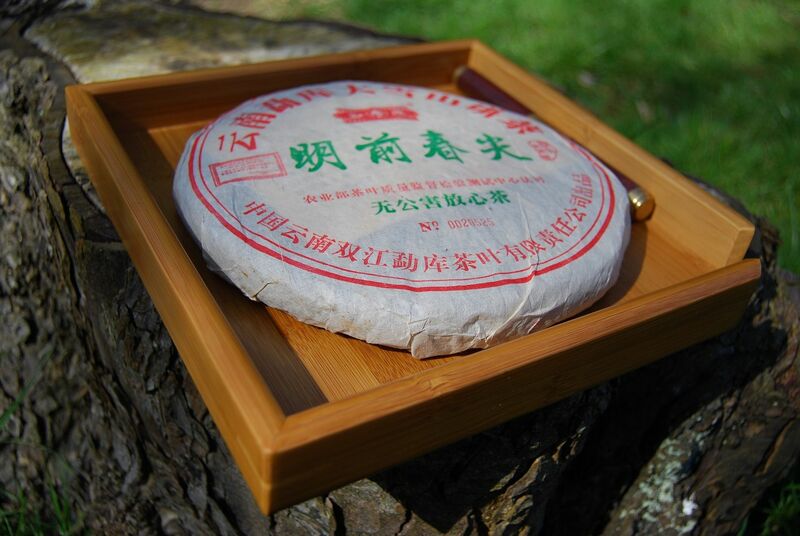 The star of the box, without any doubt, is the frankly rather amazing 1980s Guangdong Qingbing, pictured below. Such an undeserved treat requires plenty of time to appreciate, and I set aside a chunk of hours to spend some time with what is probably now the oldest whole cake in my house. 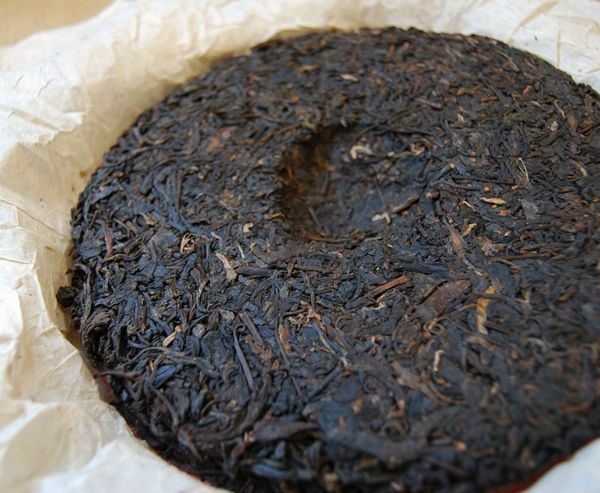 There is no wrapper to this old fellow, but a tiny, circular neifei (pictured above) which has been pressed into the cake, in the central area flattened by the mould in which the cake was pressed. This cake has been through some heavy compression, as you will be able to see immediately from the above image. 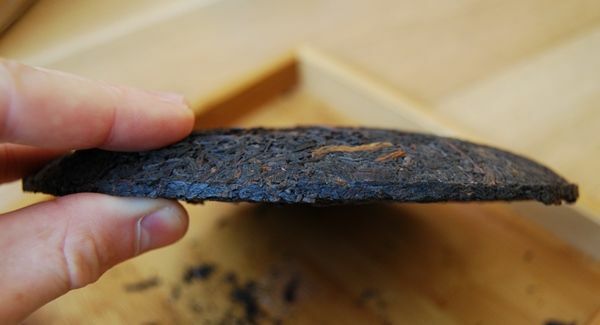 It is dense, heavy, and very thin, comprised of tiny "high grade" (i.e., small) leaves, which have turned a rusted-red colour through the twenty-to-thirty years of this cake's lifetime. 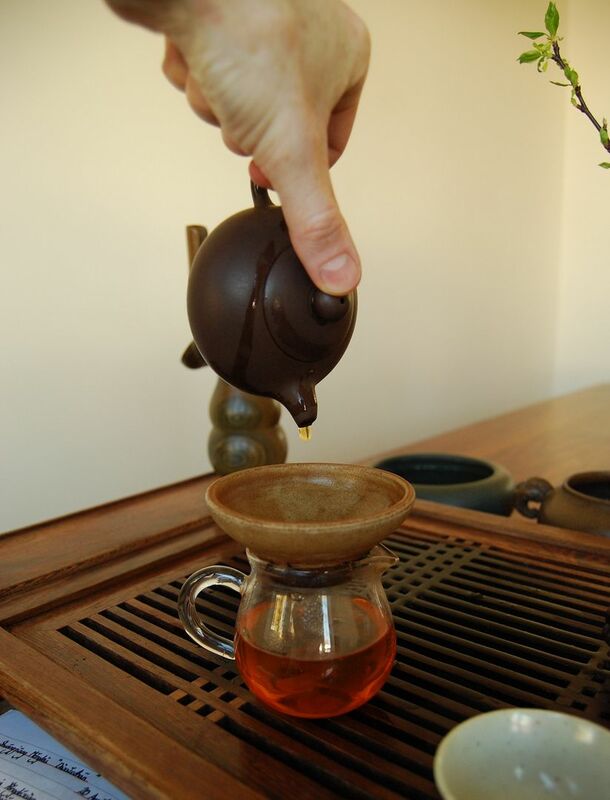 To keep Zidu [purple belly], my big pot, company, we decide to give "Xiaodu" [little belly] his first brew. What better first tea to brew than this fine, old example. I can fit a few grams inside his little belly. This cake is still very much alive, thanks to its excellent storage and tight compression. 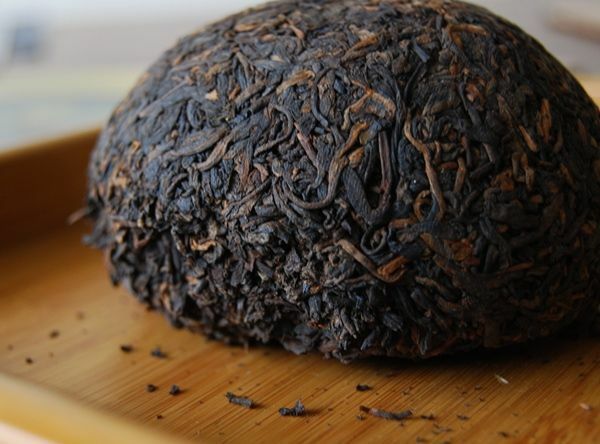 It has some of its kuwei [good bitterness] remaining, but evolved into a heavier form, which sits very well with the mahogany-wood richness of the flavour. Smooth, heavy, and full, it dominates the throat after the swallow. 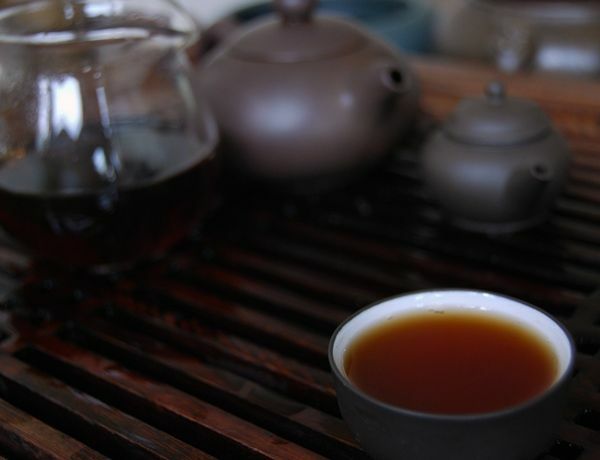 The density of its colour is accurately captured in the photograph above, which goes to show just how much power and content this tea has developed. The sweetness lasts seemingly forever, and I have a hard job even denting its power - after twenty infusions, it remains as potent as the first infusion, requiring instant water-in, water-out brews even after so much time. It is a remarkable tea. Xiaodu seems to like it very much, and his skin begins to shine under the influence of the fresh soup. 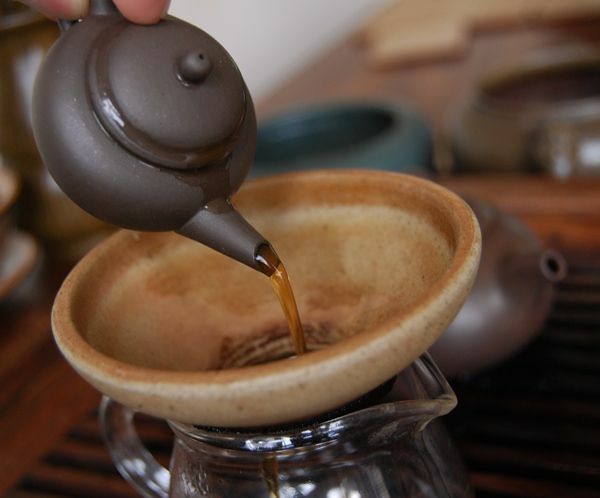 He brews precisely enough to fill one tiny cup, as pictured below. 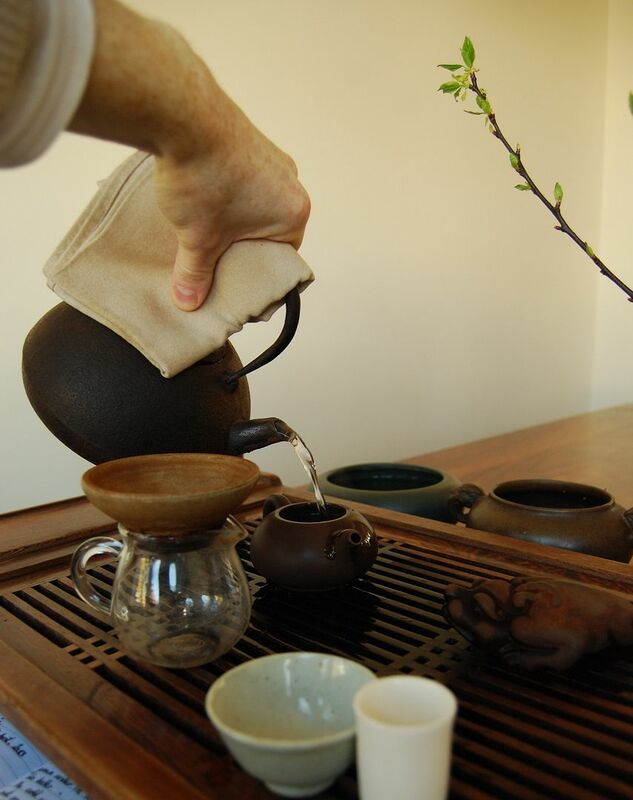 I try to keep the amount of equipment that sits on my teatable down to a reasonable level - our table is not as one typically sees in Chinese teashops, in which every horizontal surface is covered in pots and vessels. 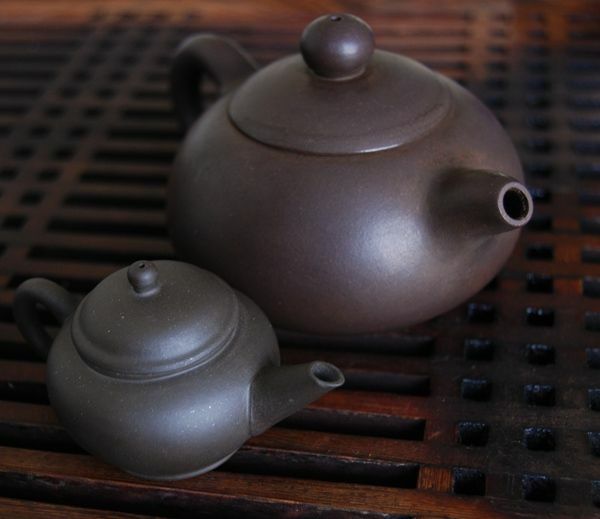 However, my regular company at the tea-table includes Zidu, Gertrude (our qingzi / celadon gaiwan), Lesseps (our chahe - "tea lotus"), and Qingchan (my zisha frog), as well as the usual array of chadao. 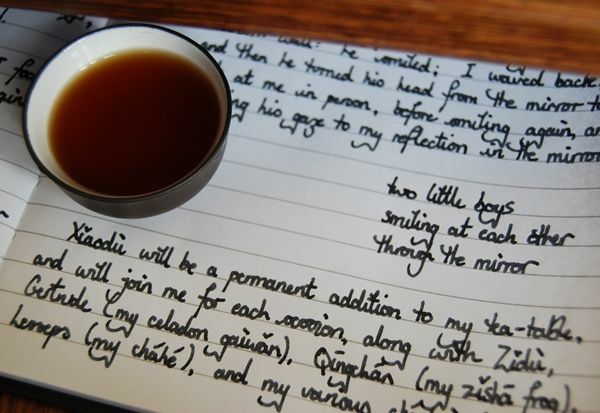 To that company, little Xiaodu will be added, and I will build up his patina along with Zidu's, so that our son Xiaohu has a pretty, seasoned pot when he is ready to brew his own tea, one day. 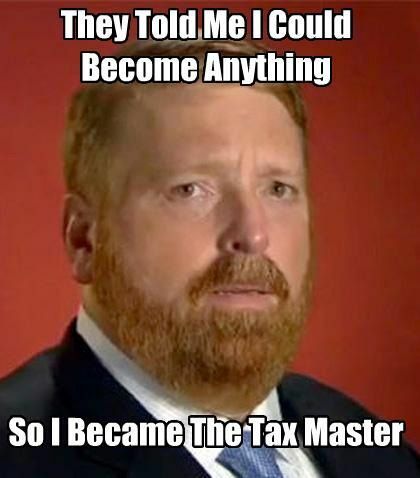 We'll be able to tell him that his pot was a generous gift. I'm looking forward to getting to Singapore, one day. It seems that we have a lot of tea-drinking to catch up on. Back in the Good Ol' Days, when we Westerners were almost entirely naive in the way of pu'ercha, there were but a handful of merchants that would sell decent tea. I remember with fond recall, the frantic rush that took place whenever Houde, one of the merchants in question, listed a new Xizihao cake. Thank heavens that those days of boom and bust, of wild purchasing without sampling, of suggestively inflated profit margins, have long past, leaving us wizened old wrinklies with the mature market for which have so long desired. If only 'twere so, for this startlingly-priced Xizihao offering from Houde sold out in under three femtoseconds. Xizihao, once the only brand in many buyer's minds, has since been supplanted by a wide range of solid producers, both Western and Eastern. 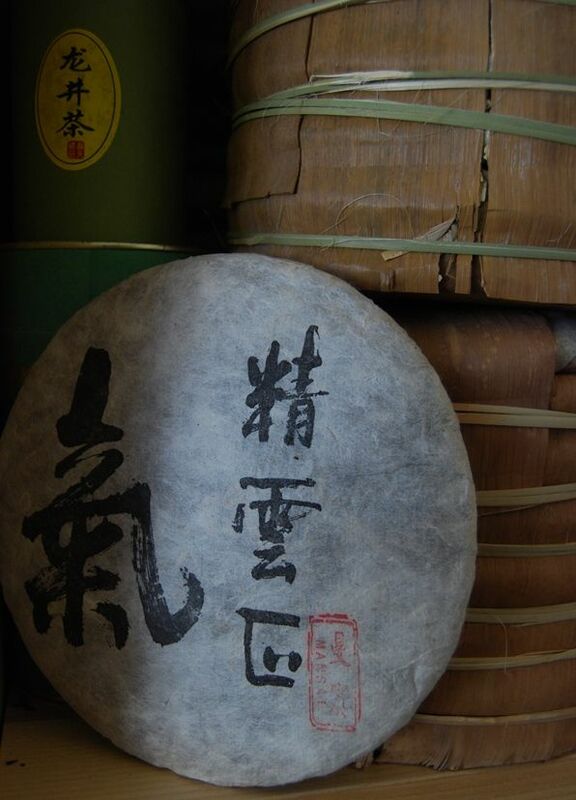 As the proprietor of Houde seems to have taken a step back from the tea business, the introduction of "XZH" cakes into the Western market has subsequently slowed. We have much for which to thank Dr. Lee: alongside the many and varied cakes that we have all enjoyed over the years, he is also responsible for the enduring legacy of the name of this brand being spelled incorrectly throughout the Western-speaking internet. 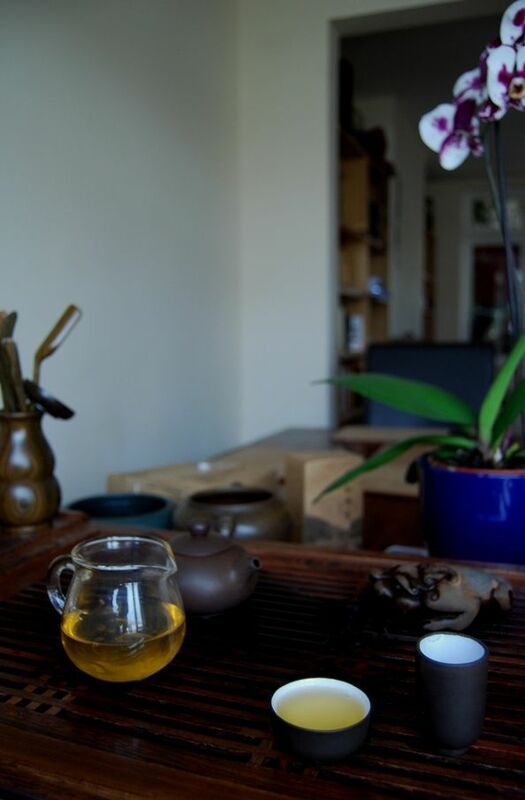 It seems that the "xiangzhutong" [fragrant bamboo tong] that I acquired was the absolute largest of the bunch, weighing in at 970g, which is the equivalent of just over two-and-a-half normal bing. I was told that this was the last one on sale, which explains its enormity. 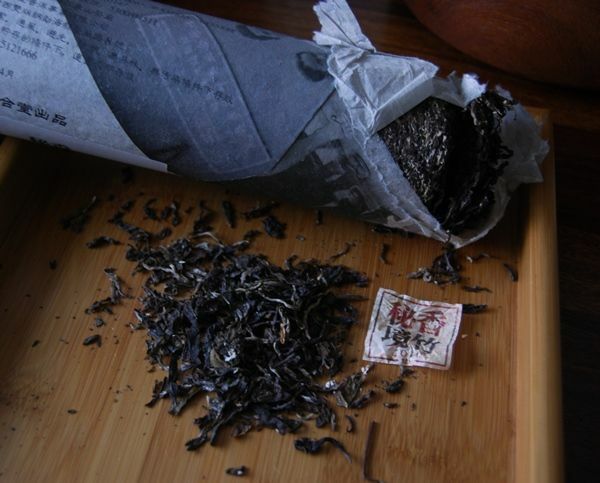 The bamboo casing has been removed, and the tea is presented as a tightly-compacted cylinder, wrapped in paper, pictured above. 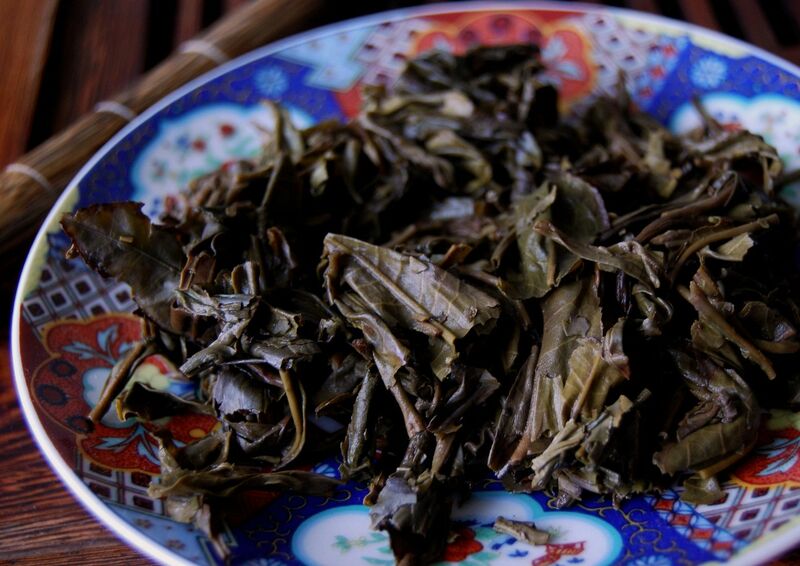 The leaves are from the Bulangshan region, which is an area that covers a vast quantity of terrain, and can mean almost anything, in terms of tea character. Quite a few productions from this area are aggressive, thinking back over recent examples. Shown above, the leaves are whole, yet quite small. They have a strong aroma of clean, orthodox sweetness. 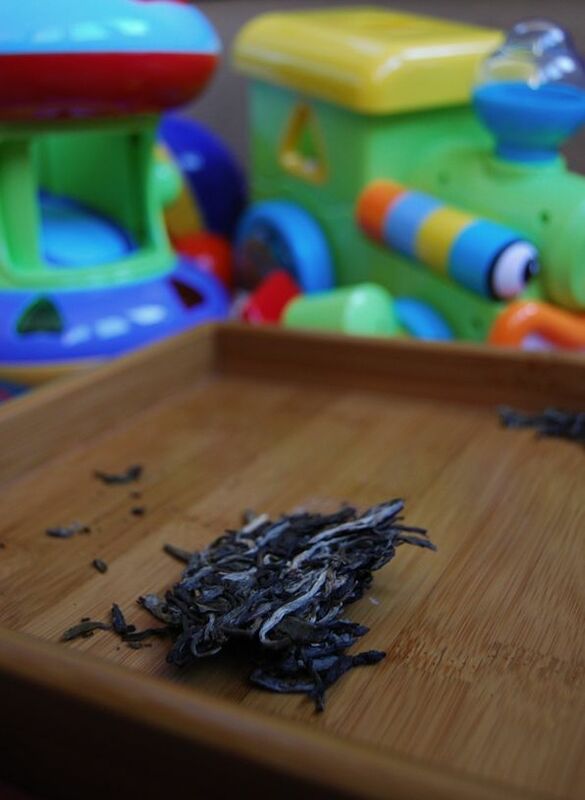 Little flecks of beige gunge are attached to the cylinder of tea, which are assumedly the flesh of the bamboo stalk. 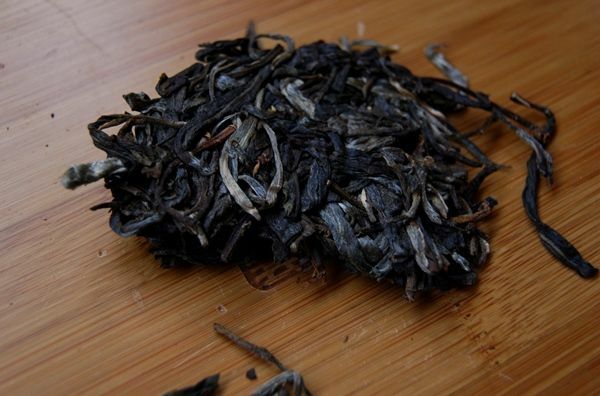 It is bold and fruity in both aroma and tasting cups. 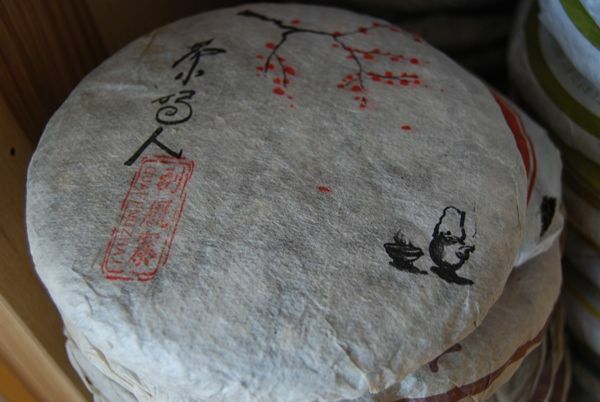 The body is thick, and I appreciate the light processing, which is evident only as a strong butteriness in the finish. 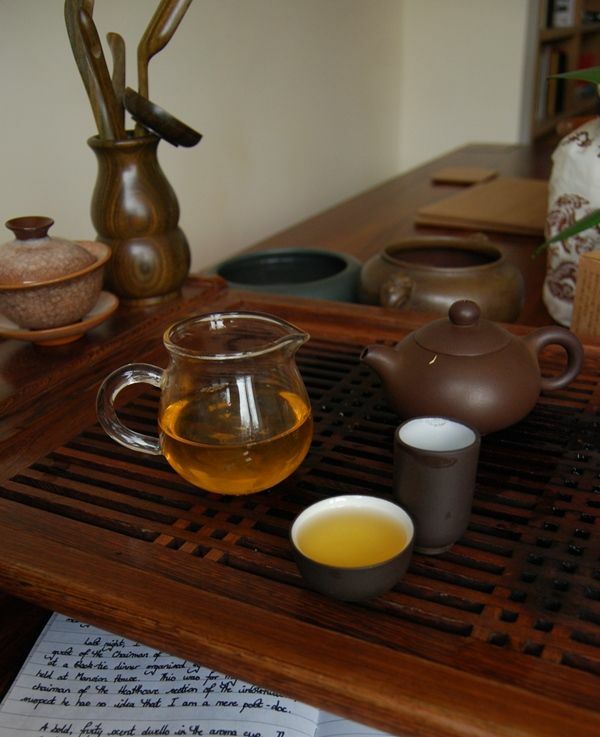 Menthol vapours act on the nasal passages, while the caffeine and chaqi give me a boost. It is fresh, tidy, and exhibits no roughness. 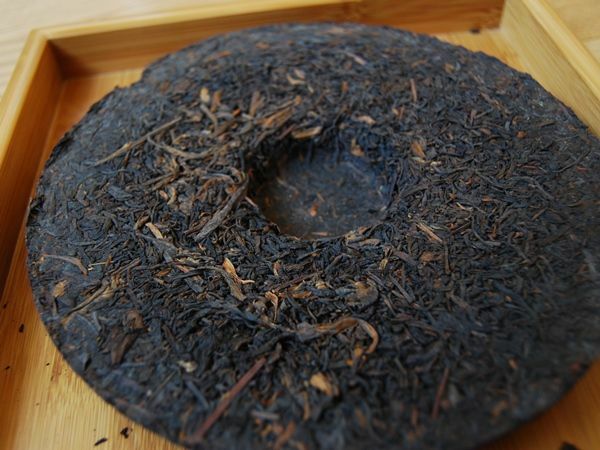 Xizihao have become very good at selling well-rounded, solid teas that tend to shy away from the more punishing end of the shengpu spectrum. 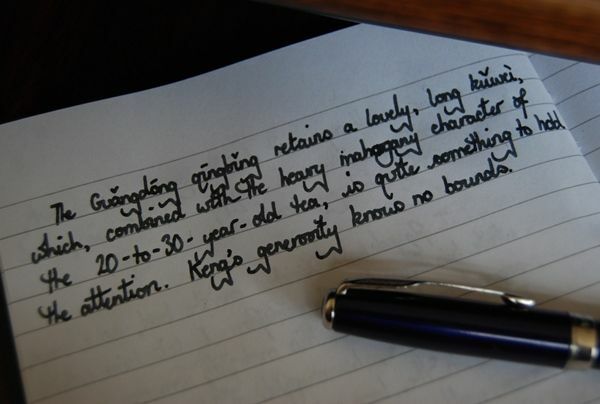 At around £38 for a bing-equivalent, this is not the most expensive Xizihao, and I feel this in the quality of the tea. It is tidy and good, but perhaps absent the complexity that would elevate it into a higher class. 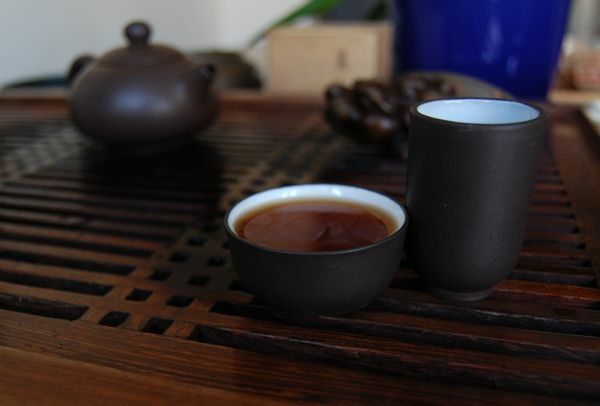 2011 Essence of Tea "Mansai"
The 2010 Mansai from Essence of Tea reminded me of my love for fat, beefy pu'ercha. Since then, a tong of it has been squatting on my shelves, its flabby waistline pushing aside its more slender contemporaries. It is a fine tea. This year, Mr. and Mrs. Essence returned to Mansai, which is in the area near Bulangshan that is currently disputed between the Zhonglish and Myanmar governments. 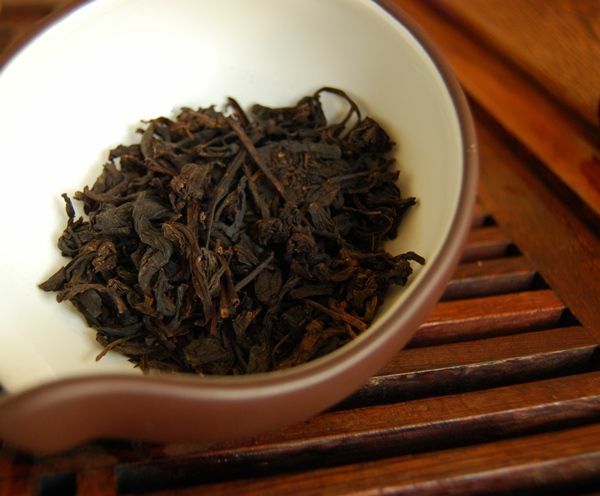 Pictured above, the leaves are typically attractive, despite Nada's description of there being increased breakage due to the long journey between remote Mansai and the factory in which the bing were pressed. Unsurprisingly, it brews a straight, yellow soup. Like last year's cake, there is quite a lot to hold the attention: it has sweet butter, summer fruits, and all manner of darkened tobacco in the aftertaste. 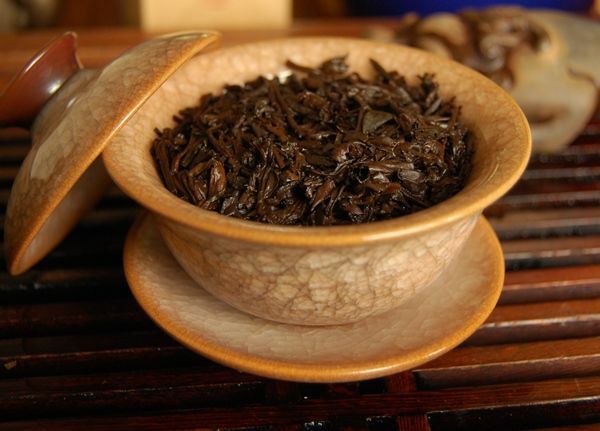 Smooth, clean, and very proper, its long journey has not noticeably affected its quality. 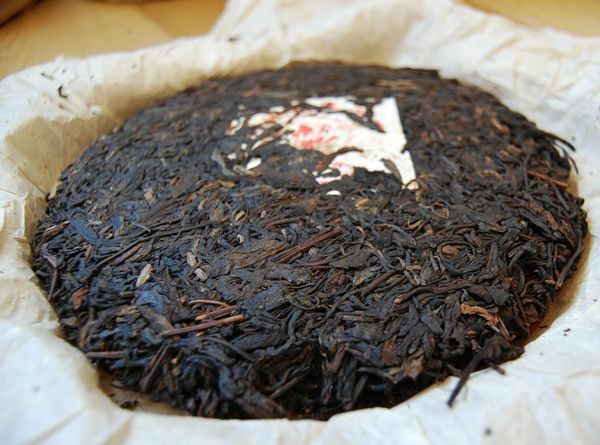 Moreso than the other cakes of this year, the Mansai has a broad base of "tea" flavour. Its kuwei is strong, but not punishing, which, along with its sheer density of character, gives me hope for its long-term prospects. In my diary, I wrote "Excellent, but not as fun as the Mannuo." Inevitably, I weigh the tea against its price. Last year, my records state that this was £25 (currently £30 for the 2010), while the 2011 is selling at £38. An eye-watering, wallet-achingly large increase of 52% over the previous year prevents me from buying more than a test cake, but it is delicious and heartily recommended. I think, overall, last year's price could be described as a substantial bargain, and this year's price more accurately reflects its place in the overall scheme of Western pricing. Recent discussion of the 8582 recipe brought to mind my Xizihao version from four years ago. This is an important cake for me, because it was one of the first that I bought in which 100% of its life has been spent with us here in England, which makes it a very useful tool for inspecting the efficacy of English storage. 2011 Essence of Tea "Guafengzhai"
The first of many impressive impressions that the Guafengzhai impressed upon me was the artwork on the wrapper. Along with the artwork from the 2009 Nadacha "Naka", it ranks among my favourites. It turns out that it was produced by Aaron Fisher, whom you will have encountered via the Art of Tea magazines and The Leaf on-line magazine. I should have guessed that it was the work of this artist, from his immediately-recognisable little teapot in the bottom-right corner of the design. 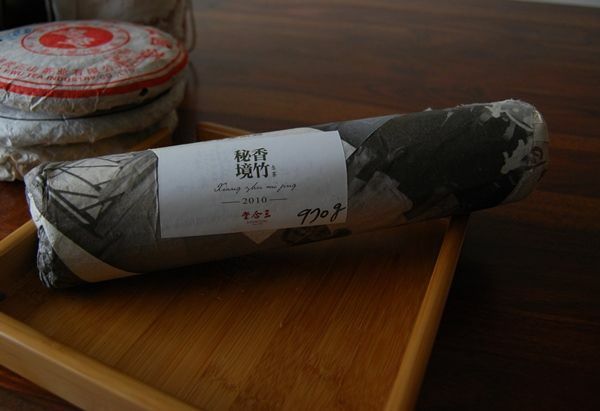 This is a xiaobing - just 200g, which you cannot really determine from the image above. I suspect that this will correspond to around 20 sessions or so, and so I resolve to go carefully, in order to make it last as long as I can. Nada has, quite reasonably, limited purchase of this cake to one per customer, given their short supply. This is the first of Nada's samples that I tried, even though I have taken my time to publish it - primarily, because I was waiting for the actual cake to arrive so that I could show you the delightful wrapper. As you can see above, the leaves are long, and whole. 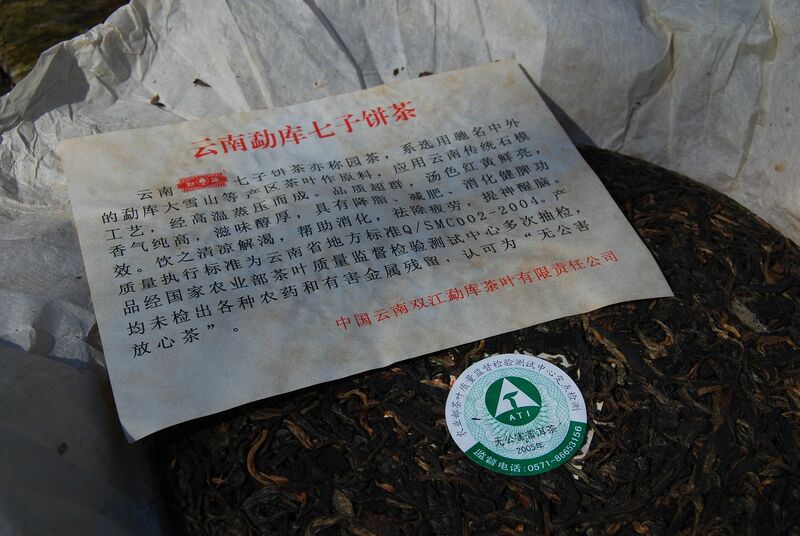 Guanfengzhai is a now-popular area of the Yiwu region from which to obtain good-quality tea. The potency of the aroma alone tells us that these are leaves with much to give: the scent of sweet leather is punchy and forthright. As one would hope, the soup is a bright yellow, indicative of processing with the very lightest of human touches. As with many endeavours, I feel that the best processing of pu'ercha is that in which the presence of the producer is almost entirely invisible. 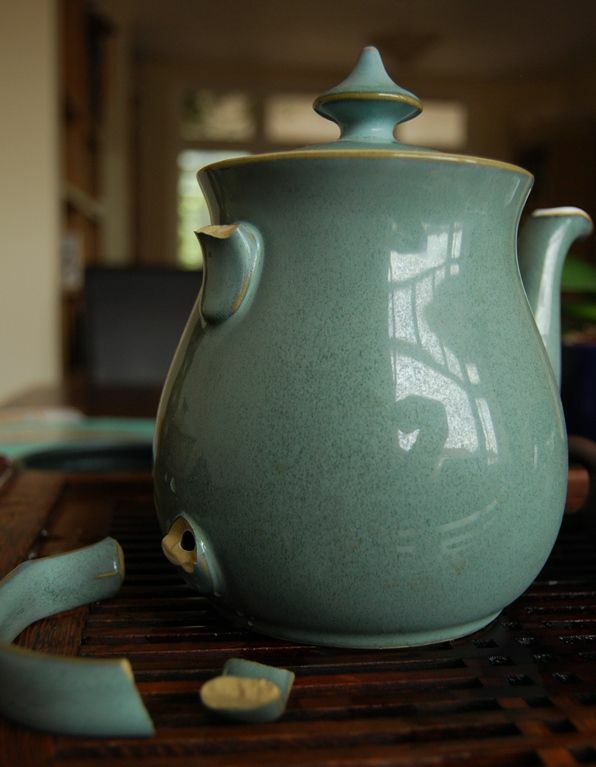 I'd much rather be drinking the tea, than experiencing someone's processing. 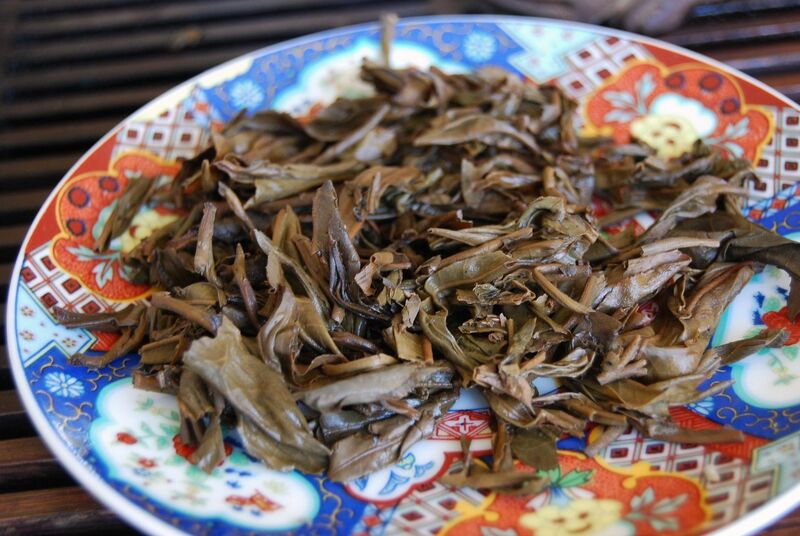 Perhaps this is one of the reasons that roasted wulong doesn't excite me to a great degree. This is a remarkable tea, being smooth, full, and obviously cooling. 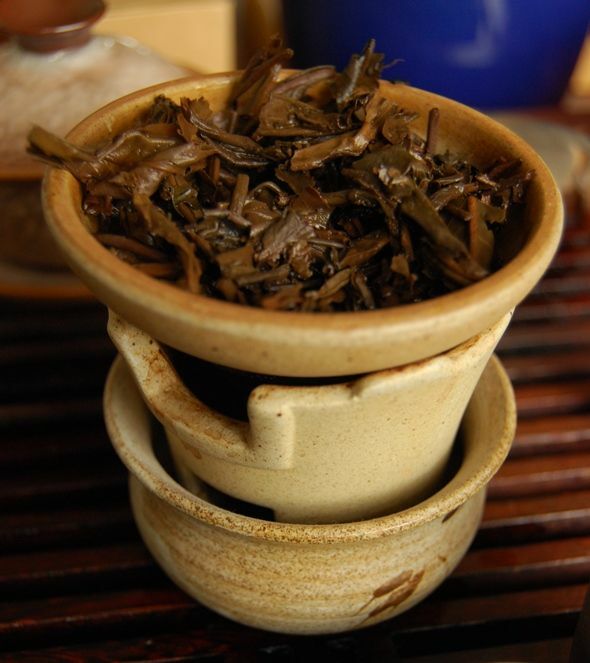 It has a clean, buttery finish from its minimal processing, and carries a fruity, sweet flavour as beloved of Guafengzhai-area leaves. Nada writes that the leaves came from a tree which is around 400 years of age. In the year 1611, four hundred years ago, one of my favourite plays, The Tempest, was being first revealed to the English audience. In the same year, my small college in the university here was founded by the Queen of the time ("a ginger monarch"). 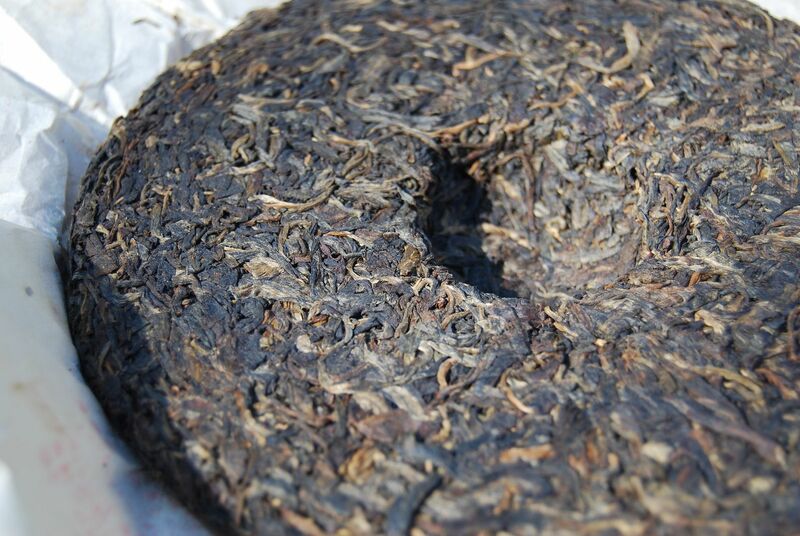 It's hard to imagine that this pu'er tree could have survived since the Elizabethan era. Tip-top tea. I hope to make this cake last a few years, at least, but it won't be easy. 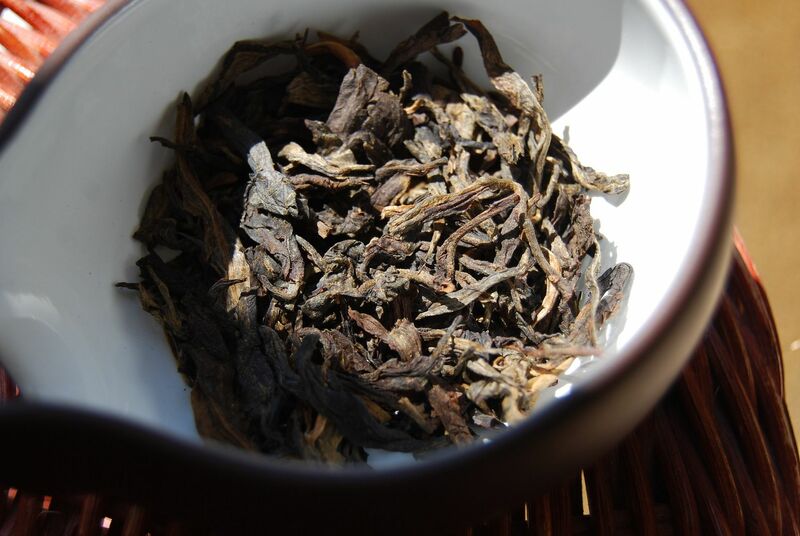 2011 Essence of Tea "Bulang"
The 2011 Essence of Tea "Bulang" is, like its predecessors, strong tea. 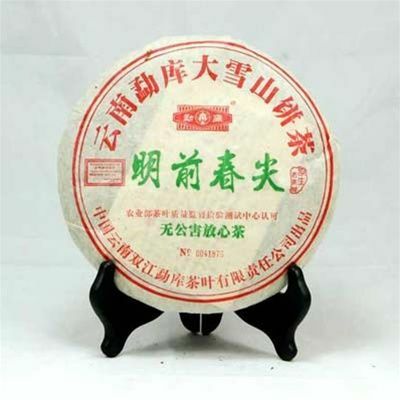 While drinking this tea, a suitable simile from popular culture came to mind to best describe its position relative to cakes from previous years. If the 2009 Bulang and 2010 Bulang are, for example, regular Taxmaster (pictured below left), then the 2011 version can be none other than Omega Taxmaster (pictured below right). As I exhaled noxious menthol fumes from this tea, Omega Taxmaster came to mind. I think that's all we need to know about this cake, and so we could end the article here. For those of you who wish for a few more details, I'm glad that you stuck around. The dry leaves are tippy, and medium in length. 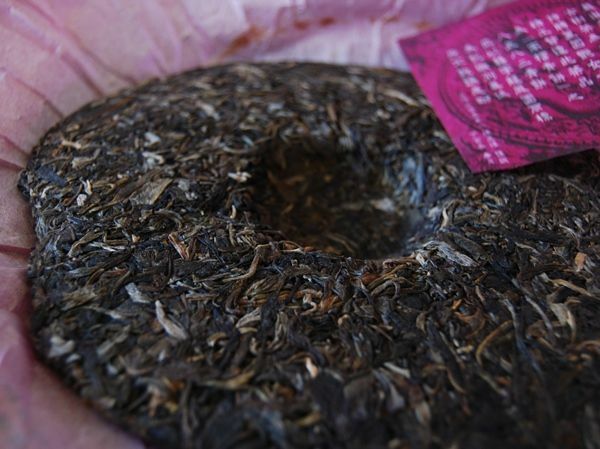 This cake comes from the same family as previous years, and so we might expect that the maocha should look fairly similar to those from older cakes. What is surprising about the dry leaves are the extraordinarily potent scents being exuded. Recalling the melee of previous years, I err on the side of caution when selecting a quantity of leaves for this session. Good bitterness arrives from the very first infusion, combined with heavy, low tobacco notes. After just two tiny cups, my head is reeling. 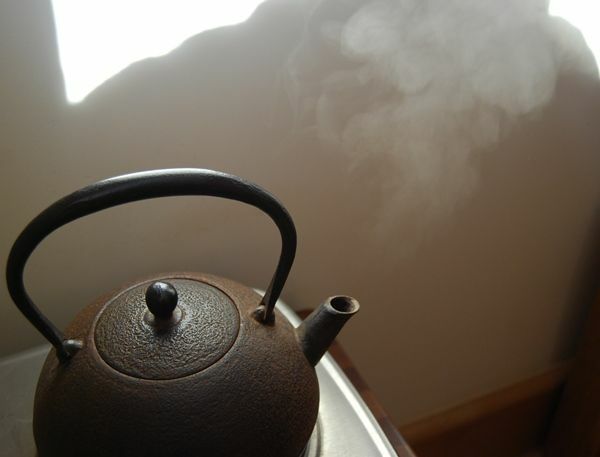 My skin tingles as the cold is pushed outwards, the tea working its way through my body at great speed. Its character is very sharp, something like grapefruit to my reckoning. I actually enjoyed the aggressive nature of the tea from previous years, but this is so significantly more violent that it prohibits any great degree of pleasure. Perhaps it will age well - it certainly has the power for it. The significant price increase of 27% from previous years (from £40 to £51) prevents me from buying more than a cake of this tea, which I retain to see how it goes. Revisiting the 2009 version after two years, I observed that it had settled into a darker, quieter mode - we might assume a similar trajectory for this latest production. I seldom encounter cakes that are genuinely too much for me to enjoy, given my love of bitterness and aggression, but this is definitely one of them. Apache and I have bought some trial cakes of this old classic, via Taobaowang. The price was approximately 30 USD after everything, which compares very well with the 40 USD price from 2011, quoted in the original article above. This is a very (very) pretty cake. The image below may not do it justice, but it exudes raw bingcha appeal. While the neipiao is getting old and knackered, the glossy ATI sticker looks as if eight years have not touched it, pictured below. I didn't quite realise how beautiful the leaves of this rather humble cake actually were. Pictured below, the majority are long and very attractive. 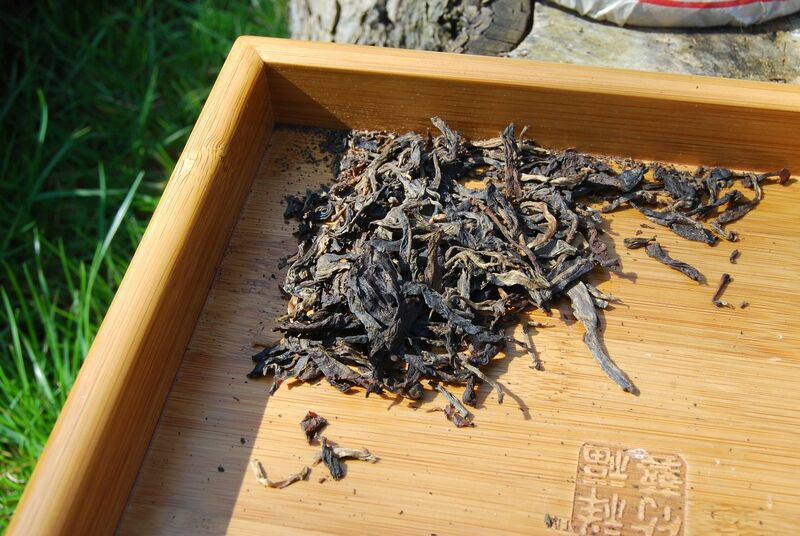 The dry leaves exude a charming scent of sweetness, tobacco, and humidity. It is a wonderful combination. It is the story in the cup that gives me pause for thought, and dials back by hyperbole a little. 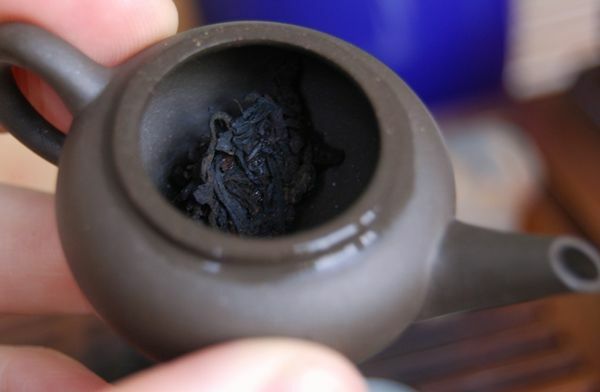 This is a very clean and accomplished little tea, and there is no doubt that it is priced well. That said, it is quite mainstream. That is, it does not scale any particular heights, but offers a base of solid sweetness and a woody character in keeping with eight years of good storage. I was ready to go a little wild over this cake, because everything was so very "right", from the start. 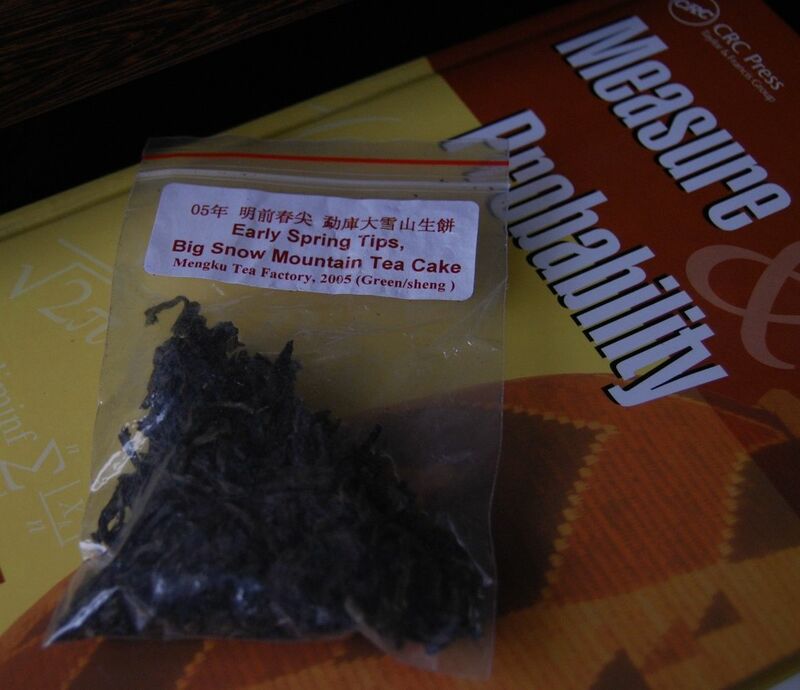 However, while stable and quite full in the mouth, it is definitely a down-to-earth tea. Ultimately, that is where I currently sit: undecided. I have rather a lot of down-to-earth tea, and probably don't need much more. Dayi cakes, for example, do the mainstream-plantation genre very well, and we have plentiful inexpensive Dayi for such drinking. However, if you have not yet reached saturation point with very solid cakes that you would like to enjoy on a very regular (daily?) basis, then this is a reliable candidate. I wrote in my journal that "It repays attention, but is easily overlooked." There is a cooling vibrancy to this cake that you wouldn't otherwise expect, but most of its kuwei has been aged out of it, and exchanged for sweetness already. You would hope for a little more left in reserve, if you were going to age it further, and I suspect that we may be witnessing "peak Mengku", more or less, for this cake. What you get for £19, though, is something of a bargain.